Ai (October 21, 1947 – March 20, 2010), was born Florence Anthony. She changed her name to Ai Ogawa. 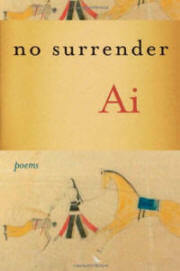 "Ai was always a fierce and uncompromising voice. The author of seven memorable books of poetry, she earned the American Book Award for Sin in 1987 and a National Book Award for Vice in 1999. As the Mitte Chair in Creative Writing at Southwest Texas State University from 2002 -2003, she earned a United States Artist Ford Fellowship in 2009. Wow, 19 views of this post as of 2:30PM Sunday afternoon... I guess no one gives a crap about Ai's work. No, no Troy, wait a minute. I'll respond. As I've said before [many times] I don't understand most poetry. Most of the time I'm like "why don't they just come out and say what they're trying to say" and I've been told "they are!" so I get that it's me. I just don't 'get' most poetry. Maybe I don't have enough of an imagination. But I went to your link and I 'got' the poetry in the post. Unfortunately The Cancer Chronicles was very familiar. Thanks for the post. I think I'll check this book out. Hi Crystal. Don't worry. I'll keep promoting the poetry and literary stuff and all the rest of what we do. Actually there was a lot of interest in the Alice Walker set of interviews I posted recently. I guess Ai is too obscure to get much of a reaction from folk let us now how you enjoy the book. (I know AI is a cause celebre in the Black womanyst femnist LGBT crowd. She's one of them people who, because her heart is in the right place, everybody is supposed to just knee jerk say they dig her. She ain'tthe only one. That's the game. I have been accused of being a poet. I write poetry. I read poetry. I don't dig AI. Don't mean she ain't good--I just don't dig her. Art is very subjective--and I, for myself. The fact that only seven people viewed it should have told you something (ie maybe nobody really digs AI--whoops! Chris, my personal opinion on what I promote is irrelevant. If I just promoted what I liked I'm sure no one would visit the website. Sure, some of the stuff I promote I do actually like, but some of it I could care less about. Much of what I promote is based upon feedback from various sources. I read reviews, I analyze my web site traffic, I look at book sales, and I listen to what the literati talk about. I even run experiments posting a variety of content to see what people like -- in many ways it is a science. I also try to balance things out. I knew before I got started Ai would generate, relatively speaking, very little interest. I however know plenty of people who LOVE her work. To answer your question I've read some of Ai’s stuff, but I'm not all that moved either. Again, I did not post the Ai stuff for my benefit, I did so for my readers. I also know that my Ai content will not generate much revenue for the site, but I'm (obviously) not drive solely by money. Yeah, I complained about the lack of pages views on the Ai post but I was really just busting y’all’s chops .